To setup emails, go to ADMIN -> Email tab. The alternate email feature is designed to allow multiple company email addresses to be forwarded and routed to your TeamSupport account. You can have the tickets associated with a certain group, product (enterprise edition only), and type of ticket to be created (issues, bugs, features, etc). *You can also setup other automation rules that can handle routing of tickets as well. See here for more info about automation. If your company has multiple support/department/distribution email addresses, you can add those in the “Alternate Emails” section. These may be addresses like “level1support@mycompany.com”, or “escalation_team@mycompany.com”. Click the “+ Add” button on the top right of the Alternate email section to create a new alternate email. Here is the form you will see. It is important to add a Description to help identify what the alternate address is used for. It is also important to put the email address which emails will be sent to in the Sending Email Address field. This is needed in order to avoid email loops. Optionally, you can assign a group that you would like the tickets to be associated with, choose the type of ticket to be created, and pick a product. If you do not want to define any one of these, simply leave them set to unassigned. If you choose to route an Alternate Email Address to a Product, we also recommend adding this email address as the “. This allows your Alternate Email Address to be used for agent entry tickets. 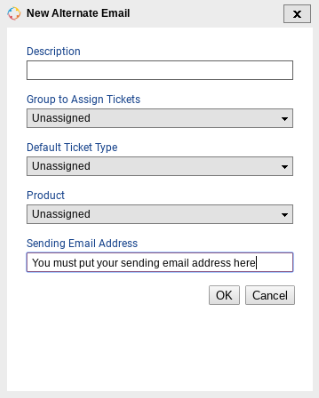 When an agent creates a ticket manually and adds a Product to the ticket, the corresponding Email Reply To Address will be used on the outgoing emails for that ticket. If a Product is changed on a ticket, the Reply to Address will not change. For example, if a customer sends into Alternate Email ProductABC@yourcompany.com which routes to ProductABC, and the Product on the ticket gets changed to ProductXYZ, the reply to email address will remain at ProductABC@yourcompany.com. Once you are done, you will see a alternate system email address as highlighted in the grid below. Simply forward the address from the “sending email address” to it’s corresponding alternate system email address. If you would like to edit the description, group, ticket type, product, or sending email address after you have created these accounts, just click the “pencil” icon on the far left. If this box is unchecked, the email addressed listed in the “Organization Reply To” address will be used for all outgoing emails.